Sulfuric acid is a very important commodity chemical, and a nation’s sulfuric acid production is a good indicator of its industrial strength. It is widely produced with different methods, such as contact process, wet sulfuric acid process, lead chamber process and some other methods. “Chamber acid” and “tower acid” were the two concentrations of sulfuric acid produced by the lead chamber process, chamber acid being the acid produced in the lead chamber itself (<70% to avoid contamination with nitrosylsulfuric acid) and tower acid being the acid recovered from the bottom of the Glover tower. They are now obsolete as commercial concentrations of sulfuric acid, although they may be prepared in the laboratory from concentrated sulfuric acid if needed. In particular, “10M” sulfuric acid (the modern equivalent of chamber acid, used in many titrations) is prepared by slowly adding 98% sulfuric acid to an equal volume of water, with good stirring: the temperature of the mixture can rise to 80 °C (176 °F) or higher. 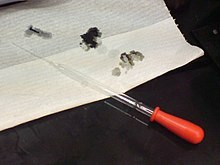 Pure sulfuric acid is a viscous clear liquid, like oil, and this explains the old name of the acid (‘oil of vitriol’). Similarly, mixing starch into concentrated sulfuric acid will give elemental carbon and water as absorbed by the sulfuric acid (which becomes slightly diluted). 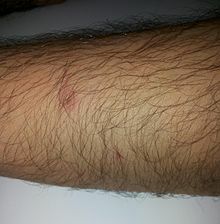 The effect of this can be seen when concentrated sulfuric acid is spilled on paper which is composed of cellulose; the cellulose reacts to give a burnt appearance, the carbon appears much as soot would in a fire. Although less dramatic, the action of the acid on cotton, even in diluted form, will destroy the fabric. Sulfuric acid is produced in the upper atmosphere of Venus by the Sun‘s photochemical action on carbon dioxide, sulfur dioxide, and water vapor. Ultraviolet photons of wavelengths less than 169 nm can photodissociate carbon dioxide into carbon monoxide and atomic oxygen. Atomic oxygen is highly reactive. When it reacts with sulfur dioxide, a trace component of the Venusian atmosphere, the result is sulfur trioxide, which can combine with water vapor, another trace component of Venus’s atmosphere, to yield sulfuric acid. In the upper, cooler portions of Venus’s atmosphere, sulfuric acid exists as a liquid, and thick sulfuric acid clouds completely obscure the planet’s surface when viewed from above. The main cloud layer extends from 45–70 km above the planet’s surface, with thinner hazes extending as low as 30 km and as high as 90 km above the surface. The permanent Venusian clouds produce a concentrated acid rain, as the clouds in the atmosphere of Earth produce water rain. 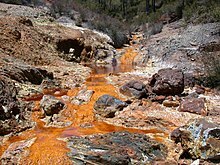 The atmosphere exhibits a sulfuric acid cycle. As sulfuric acid rain droplets fall down through the hotter layers of the atmosphere’s temperature gradient, they are heated up and release water vapor, becoming more and more concentrated. When they reach temperatures above 300 °C, sulfuric acid begins to decompose into sulfur trioxide and water, both in the gas phase. 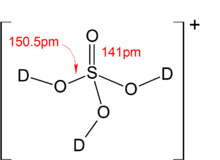 Sulfur trioxide is highly reactive and dissociates into sulfur dioxide and atomic oxygen, which oxidizes traces of carbon monoxide to form carbon dioxide. Sulfur dioxide and water vapor rise on convection currents from the mid-level atmospheric layers to higher altitudes, where they will be transformed again into sulfuric acid, and the cycle repeats. Infrared spectra taken by NASA‘s Galileo spacecraft show distinct absorptions on Jupiter‘s moon Europa that have been attributed to one or more sulfuric acid hydrates. Sulfuric acid in solution with water causes significant freezing-point depression of water’s melting point, down to 210 K (−63 °C), and this would make the existence of liquid solutions beneath Europa‘s icy crust more likely. The interpretation of the spectra is somewhat controversial. Some planetary scientists prefer to assign the spectral features to the sulfate ion, perhaps as part of one or more minerals on Europa’s surface. In early to mid nineteenth century “vitriol” plants existed, among other places, in Prestonpans in Scotland, Shropshire and the Lagan Valley in County Antrim Ireland where it was used as a bleach for linen. Early bleaching of linen was done using lactic acid from sour milk but this was a slow process and the use of vitriol sped up the bleaching process. Sulfuric acid is a very important commodity chemical, and indeed, a nation’s sulfuric acid production is a good indicator of its industrial strength. World production in the year 2004 was about 180 million tonnes, with the following geographic distribution: Asia 35%, North America (including Mexico) 24%, Africa 11%, Western Europe 10%, Eastern Europe and Russia 10%, Australia and Oceania 7%, South America 7%. Most of this amount (≈60%) is consumed for fertilizers, particularly superphosphates, ammonium phosphate and ammonium sulfates. About 20% is used in chemical industry for production of detergents, synthetic resins, dyestuffs, pharmaceuticals, petroleum catalysts, insecticides and antifreeze, as well as in various processes such as oil well acidicizing, aluminium reduction, paper sizing, water treatment. About 6% of uses are related to pigments and include paints, enamels, printing inks, coated fabrics and paper, and the rest is dispersed into a multitude of applications such as production of explosives, cellophane, acetate and viscose textiles, lubricants, non-ferrous metals, and batteries. 3) which are then used to manufacture “new” sulfuric acid. SAR plants are common additions to metal smelting plants, oil refineries, and other industries where sulfuric acid is consumed in bulk, as operating a SAR plant is much cheaper than the recurring costs of spent acid disposal and new acid purchases. John Dalton‘s 1808 sulfuric acid molecule shows a central sulfur atom bonded to three oxygen atoms, or sulfur trioxide, the anhydride of sulfuric acid. The study of vitriol, a category of glassy minerals from which the acid can be derived, began in ancient times. Sumerians had a list of types of vitriol that they classified according to the substances’ color. Some of the earliest discussions on the origin and properties of vitriol is in the works of the Greek physician Dioscorides (first century AD) and the Roman naturalist Pliny the Elder (23–79 AD). Galen also discussed its medical use. Metallurgical uses for vitriolic substances were recorded in the Hellenistic alchemical works of Zosimos of Panopolis, in the treatise Phisica et Mystica, and the Leyden papyrus X. Medieval Islamic era alchemists, Jābir ibn Hayyān (c. 721 – c. 815 AD, also known as Geber), Razi (865 – 925 AD), and Jamal Din al-Watwat (d. 1318, wrote the book Mabāhij al-fikar wa-manāhij al-‘ibar), included vitriol in their mineral classification lists. Ibn Sina focused on its medical uses and different varieties of vitriol. Sulfuric acid was called “oil of vitriol” by medieval European alchemists because it was prepared by roasting “green vitriol” (iron(II) sulfate) in an iron retort. There are references to it in the works of Vincent of Beauvais and in the Compositum de Compositis ascribed to Saint Albertus Magnus. A passage from Pseudo-Geber´s Summa Perfectionis was long considered to be the first recipe for sulfuric acid, but this was a misinterpretation. In 1746 in Birmingham, John Roebuck adapted this method to produce sulfuric acid in lead-lined chambers, which were stronger, less expensive, and could be made larger than the previously used glass containers. This process allowed the effective industrialization of sulfuric acid production. After several refinements, this method, called the lead chamber process or “chamber process”, remained the standard for sulfuric acid production for almost two centuries. In 1831, British vinegar merchant Peregrine Phillips patented the contact process, which was a far more economical process for producing sulfur trioxide and concentrated sulfuric acid. Today, nearly all of the world’s sulfuric acid is produced using this method. Sulfuric acid must be stored carefully in containers made of nonreactive material (such as glass). Solutions equal to or stronger than 1.5 M are labeled “CORROSIVE”, while solutions greater than 0.5 M but less than 1.5 M are labeled “IRRITANT”. 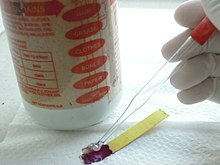 However, even the normal laboratory “dilute” grade (approximately 1 M, 10%) will char paper if left in contact for a sufficient time. ^ a b c d NIOSH Pocket Guide to Chemical Hazards. “#0577”. National Institute for Occupational Safety and Health (NIOSH). ^ a b c “Sulfuric acid”. Immediately Dangerous to Life and Health Concentrations (IDLH). National Institute for Occupational Safety and Health (NIOSH). ^ a b c “Sulfuric acid safety data sheet” (PDF). arkema-inc.com. Archived from the original (PDF) on 17 June 2012. Clear to turbid oily odorless liquid, colorless to slightly yellow. ^ a b c d “Sulfuric acid – uses”. dynamicscience.com.au. Archived from the original on 9 May 2013. ^ a b “BASF Chemical Emergency Medical Guidelines – Sulfuric acid (H2SO4)” (PDF). BASF Chemical Company. 2012. Retrieved December 18, 2014. ^ a b “Sulphuric acid drain cleaner” (PDF). herchem.com. Archived from the original (PDF) on 29 October 2013. ^ a b “Sulfuric Acid”. The Columbia Encyclopedia (6th ed.). 2009. Retrieved 2010-03-16. ^ a b c “Sulphuric acid”. Encyclopædia Britannica. 26 (11th ed.). 1910–1911. pp. 65–69. ^ “Sulfuric acid” (PDF). Determination of Noncancer Chronic Reference Exposure Levels Batch 2B December 2001. 2001. Retrieved 2012-10-01. ^ “Sulfuric Acid 98%” (PDF). rhodia.com. 2009. Retrieved 2014-07-02. ^ a b c Greenwood, Norman N.; Earnshaw, Alan (1997). Chemistry of the Elements (2nd ed.). Butterworth-Heinemann. ISBN 0-08-037941-9. ^ “Ionization Constants of Inorganic Acids”. .chemistry.msu.edu. Retrieved 2011-05-30. ^ Housecroft, Catherine E.; Sharpe, Alan G. (2008). “Chapter 16: The group 16 elements”. Inorganic Chemistry, 3rd Edition. Pearson. p. 523. ISBN 978-0-13-175553-6. ^ Pelletreau, K.; Muller-Parker, G. (2002). “Sulfuric acid in the phaeophyte alga Desmarestia munda deters feeding by the sea urchin Strongylocentrotus droebachiensis”. Marine Biology. 141 (1): 1–9. doi:10.1007/s00227-002-0809-6. ^ a b Kremser, S.; Thomson, L.W. (2016). “Stratospheric aerosol—Observations, processes, and impact on climate” (PDF). Reviews of Geophysics. 54 (2): 278–335. Bibcode:2016RvGeo..54..278K. doi:10.1002/2015RG000511. ^ Orlando, T. M.; McCord, T. B.; Grieves, G. A. (2005). “The chemical nature of Europa surface material and the relation to a subsurface ocean”. Icarus. 177 (2): 528–533. Bibcode:2005Icar..177..528O. doi:10.1016/j.icarus.2005.05.009. ^ Jones, Edward M. (1950). “Chamber Process Manufacture of Sulfuric Acid”. Industrial and Engineering Chemistry. 42 (11): 2208–2210. doi:10.1021/ie50491a016. ^ Greenwood, Norman N.; Earnshaw, Alan (1997). Chemistry of the Elements (2nd ed.). Butterworth-Heinemann. p. 653. ISBN 0-08-037941-9. ^ Beaumont, JJ; Leveton, J; Knox, K; Bloom, T; McQuiston, T; Young, M; Goldsmith, R; Steenland, NK; Brown, DP; Halperin, WE (1987). “Lung cancer mortality in workers exposed to sulfuric acid mist and other acid mists”. J Natl Cancer Inst. 79 (5): 911–21. doi:10.1093/jnci/79.5.911. PMID 3479642. ^ Annex to Form D (“Red List”), 11th Edition, January 2007 (p. 4). International Narcotics Control Board. Vienna, Austria.